3. Shuffle the Lord cards and form a face down deck on the Lords space. Then, turn over the top six cards and place them in the Court. 4. Shuffle the Location tiles and form a face down stack to the side of the game board. Then, turn over the top tile from the stack. 5. Shuffle the Monster tokens and place them, face down, by the game board. 6. Place the Threat token on the Threat Track as shown. 7. Place the ten Key tokens in a pile near the board. 8. Each player takes one Pearl from the supply, storing it in one of the plastic cups. The remaining Pearls are placed in the leftover cups and set beside the board to form a "Treasury". 9. Randomly determine the starting player. 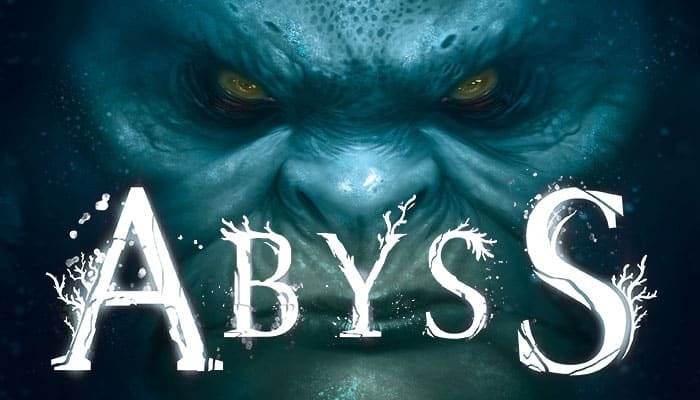 To be crowned King of Abyss you must have the most Influence Points ("IP") at the end of the game. Influence Points are mainly gained by affiliating Allies, recruiting Lords, and controlling Locations. Also, each Monster you slay during the game will earn you the gratitude of your peers-and an Influence Point bonus. Plot at Court (Optional) : You may spend one or more Pearls to bring new Lords to Court. Take One Action (Mandatory): You must choose one of the following three actions: Explore The Depths, Request Support From The Council, Recruit A Lord. Control Locations (Mandatory): When you gain a third Key, you must take control of a Location. ou may perform this action as many times as you want (as long as you can pay and there are empty spaces). If there are no empty spaces at Court or if the Lord deck is empty, you may not Plot at Court. The Five Allied Races: Squids in blue, Shellfish in green, Crabs in red, Seahorses in yellow, and Jellyfish in purple. Each Race is made up of 13 cards as follows: one value 5 card, two value 4 cards, three value 3 cards, three value 2 cards, and four value 1 cards. You must first offer the other players the opportunity to buy this Ally from you: ask each player in turn, going clockwise. Each player can either pass or purchase the Ally. The first player who chooses to purchase the card pays its cost to you. Then, they add the Ally card to their hand. The cost to purchase an Ally increases during your turn. The first Ally purchased costs 1 Pearl. The second costs 2 Pearls, and the third costs 3 Pearls. It doesn't matter which player purchases the Allies! 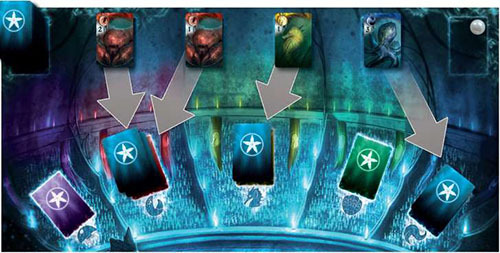 Important: Each of your opponents can only purchase one Ally during your turn! leave it in its space on the board and reveal the next card. You must then offer the new card for sale, and so on. If all the spaces on the Exploration Track are filled with Allies, and none of your opponents wants to buy the last Ally you revealed, you must add that Ally to your hand. You then gain one Pearl (as shown on the board). You must either fight the monster or keep exploring. Some spaces on the Threat Track offer a choice between multiple awards. After defeating the monster, return the Threat token to the first space of the Threat Track. Your turn now ends. If you decide to keep exploring, move the Threat token one space up the track and continue revealing cards, as above. Important: When a Monster is revealed on the last space of the Exploration Track,you must fight it. In addition to the reward shown on the Threat Track,you also receive one Pearl (as shown on the board). On the 1st space, they win 1 Pearl OR 1 Monster token. On the 2nd space, they win 2 Pearls OR 1 Monster token + 1 Pearl OR 2 Monster tokens. On the 3rd space, they win 1 Key token. 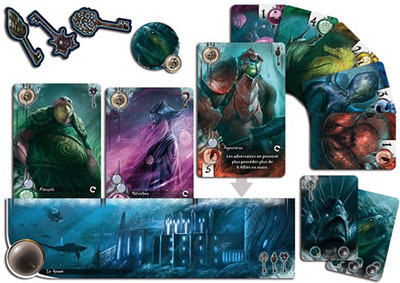 On the 4th space, they win 1 Key token +1 Pearl OR1 Key token + 1 Monster token. On the 5th space, they win 1 Key token + 2 Pearls OR 2 Key token + 1 Pearl + 1 Monster token OR 1 Key token + 2 Monster tokens. On the 6th space, they win 2 Key tokens. 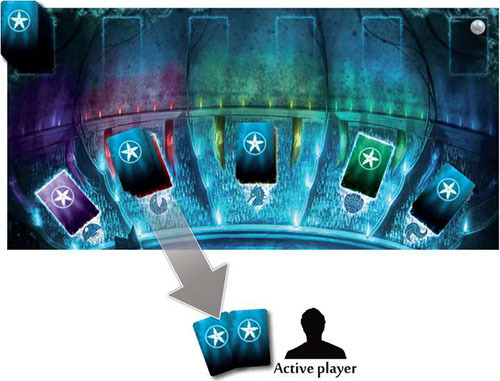 The active player reveals the 1st card and offers it to their opponents who do not wish to buy it. The player can then take it for themselves but would rather continue Exploring. They thus reveal a 2nd card. This time, the next two opponents turn it down, but the 3rd pays a Pearl to the active player to add this ally to their hand. 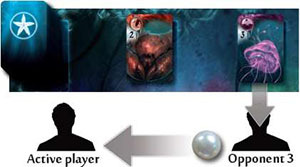 The active player reveals a 3rd card which is placed on the 2nd space. It's a Monster, which they decide not to fight in order to continue their Exploration. The Threat token therefore moves up one space on the Threat tracker and the Monster remains in place. Then, they reveal a 4th card, which is bought by the 1st opponent for 2 Peals, as it's the 2nd Ally purchased this turn. 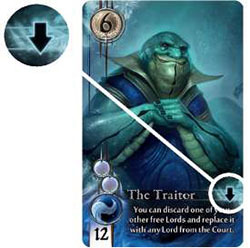 Then the active player reveals 3 more cards that their opponents turn down or can no longer afford and which does not interest the active player either. But the 7th revealed card is placed on the last space of the board. The player is thus forced to add it to their hand and takes a bonus Pearl from the Treasury. Their turn ends. Once you have decided to either add an Ally to your hand or fight a Monster, your turn ends. 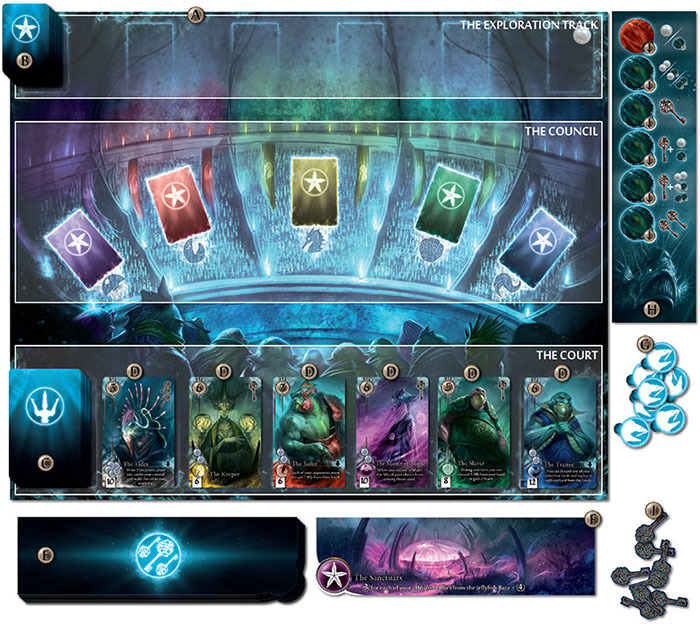 All Allies that remain on the Exploration Track are placed, face down, on the spaces matching their Race in the part of the board called the "Council". Any Monsters are placed in the Exploration discard pile. Note: If the Exploration card deck runs out, form a new face down deck by re-shuffling all of the cards in the discard pile. When you request support from the Council, take all of the cards from one stack in the Council-without looking at them beforehand!-and add them toyour hand. Soldiers are not very popular and are worth fewer Influence Points, but their Powers are useful against your opponents. Mages are gifted at obtaining favors from the Allied Races. Farmers have no Powers, but are worth many Influence Points as they grow the Sargasso-the nourishing algae sought by all. Merchants will give you precious Pearls, without which you will find it very hard to master your destiny. Politicians are widely disliked and have few scruples. They're very useful to sway the control of Lords. Ambassadors will allow you to more easily gain control of the most sought-after Locations. A. The name of the Lord. The total number of bubbles indicates the exact number of different Race types required. The large bubble indicates the mandatory Race. For the smaller bubbles, the choice of Race is left up you. The number under the bubbles indicates the total value of Allies you need to play to recruit that Lord. If the Power is marked with an arrow, it is applied only once, when the Lord is recruited. If there is no arrow, this Power is semi-permanent: it lasts until this Lord is used to control a Location (in which case the Power is hidden by the Location). D. Some Lords have a Key symbol, which can be used to control a Location. E.Finally, each Lord you recruit will grant you a certain number of Influence Points! On your turn, you may choose to recruit one of the Lords available at Court. To recruit a Lord, you must play enough Allies from your hand to pay the costs shown on that Lord card (see inset). You must play the exact number of different Races required (no more and no less). You may play multiple Allies from the same Race. The total value of the Allies you play may be more than what is required, but no "change" is given: the extra Ally "points" are lost. You may spend Pearls to help recruit: you must still play at least one Ally from each of the required Races, but if the sum of the card values is not high enough, you can spend one Pearl for each missing point (Pearls are paid to the Treasury). All Ally cards used to recruit a Lord are placed in the Exploration discard pile except for the one with the lowest value. This ally becomes "affiliated" with your cause: place it face up in front of you. If you discard multiple Allies with the same lowest value, you choose which one to keep. Affiliated Allies remain in front of you for the rest of the game. They cannot be used to recruit Lords, but they are counted in the final tally of Influence Points. After paying the recruitment costs, place the Lord face up in front of you. This Lord is said to be "free" and is available for use. Most of the Lords have a Power that is applied immediately when the Lord is recruited, and only once. These Powers are marked with an arrow. Some Lords have a "semi-permanent" Power that remains in effect until that Lord is used to control a Location. These Powers are not marked with an arrow. Note: A player who controls a Lord decides at which point during their turn the Lord's semi-permanent Power is applied. After you recruit a Lord, slide the remaining Lords in the Court to the right, so that any empty spaces are all as close to the deck as possible. If there area t least three Lords left in Court, the recruited Lord is not immediately replaced. 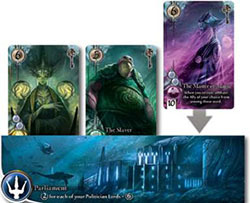 But, if there are only two Lords left, you gain two Pearls (as shown on the board), and you must fill a ll empty spaces in the Court by turning over Lord cards from the top of the deck. The Slaver by using his two shell Allies for a total value of 6 and by completing with the use of two Pearls. He'll then affiliate his shell Ally of value 1. However, he can't recruit the Traitor as he has no squid Ally in his hand. 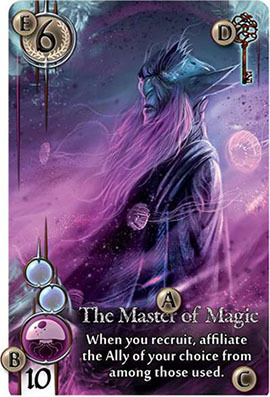 If he decides to purchase the Master of Magic or the Slaver, he'll also gain two Pearls and the Court will then be refilled. As soon as you gather three Keys (Keys are gained when you recruit a Lord with a Key symbol or by fighting a Monster while Exploration) you must immediately take control of a Location. A. The name of the Location. B. A symbol: Which gives an indication on how to win influence points with this Location. C. The Influence Points gained will be totaled at the end of the game. Draw 1,2,3, or 4 Locations and choose one from among those drawn. Then, place the rest face up beside the board, making them available for later turns. In this way, the more options you give yourself, the more choices you provide for your opponents! Place your chosen Location in front of you. Any Lords used to control that Location must be slid underneath it so that their Powers are covered-these Powers are no longer available for the rest of the game. Also, the Key(s) on that Lord is used, and cannot be used again. A Lord beneath a Location is no longer "free", and cannot be the target of any Power of another Lord. These Lords are still worth the Influence Points indicated on their cards at the end of the game. Any Key tokens (gained by fighting Monsters) that you used are simply discarded and returned to the pile. If you gain multiple Key tokens at once, and you end up with more than three Keys in your possession (including any provided by Lords),you may choose which Keys you will use to take control of a Location. Note: Some Lords (the Ambassadors) have 3 Keys, which allow them to control a Location all by themselves. In this case, remember to slide the Ambassador under the Location so its Power is hidden. When you have finished your mandatory actions, your turn is over. The player to your left now begins their turn, following the same steps as above. Players continue taking turns until one of the end-of-the-game conditions is met. Any player recruits a Lord and the Court needs to be refilled, but there are not enough Lord cards left to completely fill the Court. In either case, the active player completes their turn normally. Then, each of the other players gets to take one last t urn. Finally, each player places (affiliates) the lowest-value Ally of e ach Race they still hold in their hands. Any other Allies in hand are discarded. The Monster tokens you hold. The player with the highest Influence Point total wins the game. If there is a tie, the tied player with the most Pearls win. If they are still tied, the one with the highest value Lord wins.